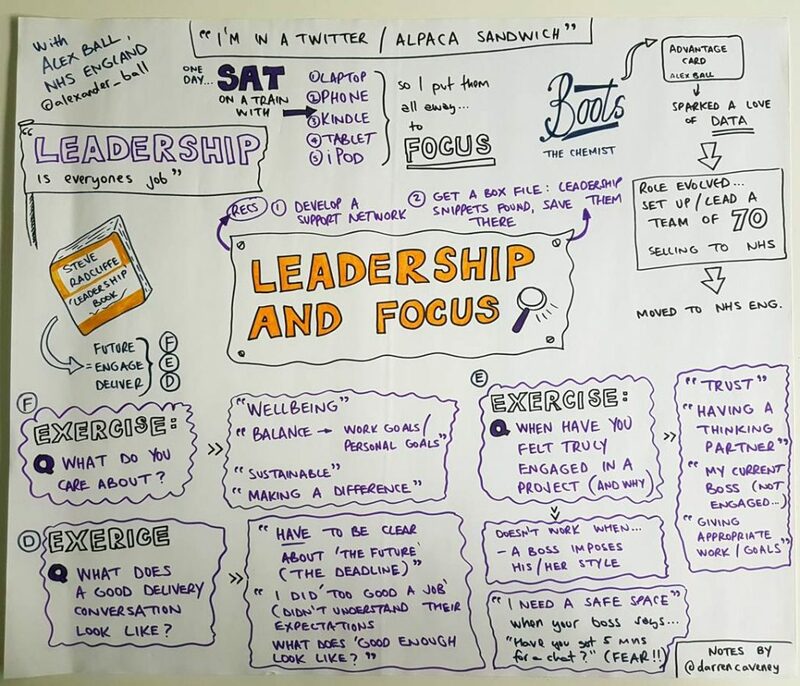 In the last of three blog posts – using my (very basic) hand-drawn workshop notes – here are the lessons and advice to emerge from an excellent Comms Unplugged session led by Alex Ball on ‘Leadership, Focus and Relationships’. Boy, Comms Unplugged feels like a long time ago now doesn’t it? Halloween and bonfire night have passed us by since but actually Comms Unplugged was only eight weeks ago. The legacy of the time spent in our beautiful Dorset field still keeps on giving. And so it felt timely to share some more of that learning here. One of the sessions I attended was run by the excellent Alex Ball, then head of communications with NHS England but now director of communications and engagement at NHS Nottingham and Nottinghamshire ICS. That’s a lot of distraction and no wonder he couldn’t focus effectively. His solution? Yes, you guessed it – he put them all away. Music to the ears of a Comms Unplugged organiser. It’s an obvious solution but a harder thing to actually do in practice because our screens have become a habit which we need to get a stronger grip on. The third thing Alex spoke about was relationships and behaviours within projects, and specifically what worked and what didn’t. Exercise 1: Professionally, what do you care about? Exercise 2: What does a good delivery conversation look like? The session was an excellent use of just an hour and provoked plenty of thoughts about how we can all apply simple but effective leadership behaviours into some of these conversations and relationships. We don’t work in perfect worlds – and we will always have a/some difficult working relationships – but if we can incorporate some of this thinking and it improves a situation or project by just 10% then it has to be worth trying. Thanks to Alex for giving up his time to join us in Dorset. We’ll hopefully see him back in the field next year. Comms Unplugged 2019 will take place 5 – 7 September. Follow @CommsUnplugged for all the latest updates.